To provide fun, safe, consistent, age appropriate development of players, which progressively prepares them to advance to the next level of competition. We have implemented the required child abuse and protection compliance processes as well as providing concussion awareness and training materials. EBA takes very seriously your trust in us to provide the safest and most enjoyable baseball and softball program possible. Protecting the children and youth in our community is of the utmost concern for the entire organization. EBA has previously conducted background checks on all our managers, coaches and assistant coaches before they are permitted to lead our kids on the playing fields. We at EBA will continue to conduct these checks in accordance with the requirements of our insurance company AND applicable state and federal laws. PA State Police criminal background check clearance. Department of Human Services (DHS) Child Abuse clearance. FBI criminal background check clearance, which includes fingerprinting (if lived in PA for less than 10 years). We understand these clearances may be a challenge and burden for some to obtain. However, we are required under the law to collect these from our volunteer managers and coaches. Only the FBI checks will cost our volunteers. The state checks are available online and all fees are waived for volunteers of the EBA. Thank you for your understanding and patience with this process. We all share in the responsibility of protecting our kids. Reporting Requirements: We follow the guidelines that the Little League(R) has published. If you have any concerns or questions, please contact our Safety Officer. All injuries should be reported on injury reporting form and forward to the Ephrata Baseball Safety Officer as listed here. The Head Coach of the team should complete and submit. Important: This is not an insurance claim form. If a claim needs to be filed, the Safety Officer will contact you and provide a claim form. Every year, the Uniforms & Equipment Coordinator inspects the bats, balls, helmets, catcher's gear, tees, and other equipment for safety condition. Players may use their own equipment but they do so at their own risk and the EBA is not responsible for inspecting the safety of that equipment. Each coach is provided one first aid kit at the beginning of the season. Additional ones are available upon request to the Safety Officer. 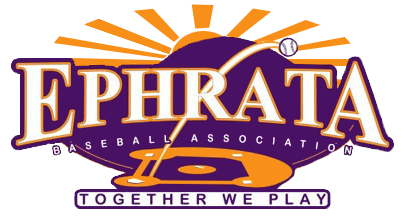 If you have any questions or concerns about safety, please contact our Safety Officer listed on our contact us page or email info@ephratabaseball.org. The Dangers of Playing "More"
Our youth sports culture is trending towards specialization and increased play than ever before. We've all heard about sore arms, leg injuries, and other injuries but the appeal of getting better and playing vs "higher level" competition still drives us to enroll our children in multiple leagues and year-round same sport clubs. Adrian Shelley, Ephrata High School baseball coach says "playing MORE is simply that . . . it's more. It doesn't suggest benefit. In fact, we now have statistical evidence to suggest that MORE play is dangerous which gives us more research-based rationale for our 75% rule." The EBA prefers that our players participate in other sports, however, for those who choose to focus primarily on baseball, our organization is committed to shutting our players down during the off months and shifting their focus away from baseball-specific instruction and drills in order to focus more on performance training and conditioning the entire body. Playing for multiple teams in multiple organizations encourages players to play even more, and can complicate the need to responsibly monitor the health and safety of the player. Unless a comprehensive monitoring plan is coordinated between those organizations, where everyone involved is actively auditing a player's health (specifically throwing-related arm pain), then we feel that excessive play is not only unnecessary, but a significant risk. This study substantiates our philosophy​. For more information, here is an article that refers to the study previously mentioned. Article - "I Never Thought it would End This Way"
Article - Dangers of "Playing More"